Ola, India's largest on-demand cab hailing service, burnt as much cash as the country's top three legacy online travel agencies—MakeMyTrip, Yatra and Cleartrip—put together in 2014-15, as it left no stone unturned to stave off competition from US-based rival Uber Inc.
ANI Technologies Pvt Ltd, which operates Ola, posted a seven-fold rise in revenue from operations to Rs 380.2 crore for the year ended 31 March 2015 from Rs 49.6 crore in FY14. But total expenditure climbed at twice that pace—14 times—to Rs 1,173 crore, due largely to a 19-fold rise in the company's fleet operator costs to Rs 905 crore. This widened its net loss to Rs 754.8 crore from Rs 34.2 crore in the previous year. The high-paced business growth led to a surge in ads and sales promotion expenses to Rs 96.6 crore from Rs 3.8 crore. Communication costs shot up to Rs 23.3 crore from Rs 61 lakh and employee expenses more than tripled to Rs 68 crore from Rs 20.38 crore. These figures do not include financials of TaxiForSure, which Ola acquired toward the end of the financial year for around $200 million. Ola, a private company that was valued at $5 billion in its last funding round in August 2015, will be required to file its financials for 2015-16 with the Registrar of Companies later this year. An email query to the firm on its past financial performance did not elicit any response. 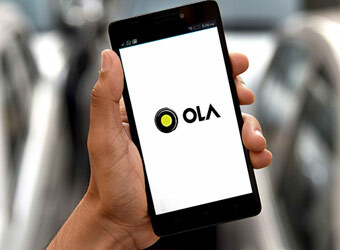 Mahesh Murthy, founder of Pinstorm and co-founder of Seedfund, said the numbers indicate that Ola's Rs 100 crore monthly expenditure could have risen further in the year ended March 2016. "At the current rate, it's hard to see if or when the company can ever become cash positive," said Murthy, who has been critical of many consumer Internet firms in India. "The worry is this - with a larger and more endless pool of money available at Uber, it would seem that an unending pool of money is the only weapon to fight to survive. There seems to be little move for any product, offering or revenue differentiation. When the endgame happens one party of investors will have a huge gaping hole of red ink on their balance sheets," Murthy added. Ola vs Uber To be sure, Ola is undersized at a $5 billion valuation when compared with Uber's $62.5 billion valuation. Ola's total fundraising till date (around $1.2 billion) is smaller than Uber's last fundraiser round (at $3.5 billion), which it secured earlier this month from Saudi Arabia's Public Investment Fund and has committed a large part of it toward its Indian operations. But Ola has been more aggressive in India. The firm has raised around $1.1 billion in the last two years alone from a bunch of investors including SoftBank, Tiger Global, DST Global, Steadview, GIC and Uber's Chinese rival Didi Chuxing, according to VCCEdge, the data research platform of VCCircle. Indeed, Ola earned around Rs 38 crore—or close to a tenth of its total revenue of Rs 418 crore—from interest income and sale of securities from the investments made from the money it raised in the past. Last year, Ola acquired TaxiForSure to pre-empt Uber from snapping at the cash-starved cab startup and stretched its lead over the American rival in terms of fleet size. Although Uber is present in far fewer cities and its comparable financials are not available, the US-based taxi hailing giant had claimed early this month that its market share is the same as that of Ola. However, Ola is no mood to back off and has been launching a slew of new services. In an interview to Bloomberg recently, co-founder and CEO Bhavish Aggarwal contended that Ola had a better grasp of how to operate in India and that it was more familiar with local conditions. Ola is also part of a global alliance—seen as an anti-Uber group—that includes Lyft and Didi Chuxing. "Uber conquered a market where people had cars in their garages. In India, we didn't have garages, we didn't have cars, we didn't even have roads," Aggarwal told Bloomberg. Last week, Ola hinted at the introduction of a pilot version of its latest offering, an hourly rental service which could probably be called 'Rentals', according to information on its Google play store page. Last month, it launched 'Lux', where users can book luxury cabs including Jaguar, Land Rover, Audi and BMW for Rs 19 per km with ride time charges of Rs 2 per minute. The service is currently available in South Mumbai and Delhi NCR. In April, Ola started offering electric rickshaws on its mobile app. Since May, Ola has also been relaunching its outstation cab services. Ola had introduced this service during the initial years of its operations and had discontinued it in 2013. In February, Ola rolled out its low-cost offering Micro as a pilot initiative in Mumbai. It gradually expanded Micro to other cities and the company claims that Micro has been its fastest-growing segment. Meanwhile, Uber has been slashing tariffs as opposed to launching new services. Last week, Uber lowered the tariff of low-cost offering UberGO in the Delhi-NCR region to match Ola Micro. In April, Uber cut fares by up to 22% in 10 non-metro cities. Ola and Uber offer more than one type of cabs with different price points to attract separate consumer sets. They also offer other urban transport solutions such as pooling services and autorickshaw hailing. Both these firms also compete with legacy domestic players like Meru, which was forced to relook its business model and went asset-light a few years ago. Though not as heavily funded as the other two, Meru is also backed by financial investors.